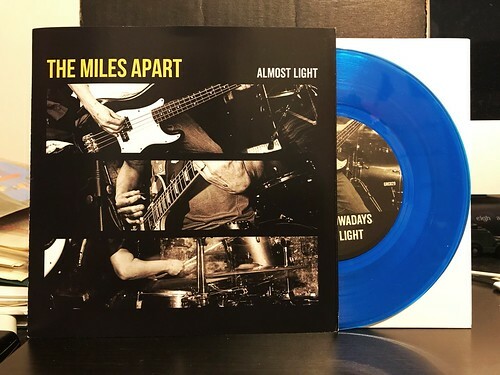 What a blast from the past it was to see a new release from Italy's The Miles Apart. Forming from the ashes of the very wonderful Eversor, The Miles Apart put out a handful of albums and singles during the early 2000's. This band was on my radar mostly due to being such a big Eversor fan, but also because they were one of those bands featured on a Snuffy Smile split 7". When that happens, there's pretty much a one hundred percent chance I'm going to hear your band. This 7" features three songs from The Miles Apart, their first new material in over ten years. It doesn't sound like it's been that long at all as the band picks up right where they left off, turning in three songs of their melodic, bright and ultra catchy pop songs. Their band name is also the name of a pretty spectacular Mega City Four song, and you can certainly hear the influences of not only MC4, but the entire early 90's scene they sprang from. Hints of Senseless Things creep up in "Lost In Nowadays" and you can hear some of the energy and guitar dynamics of early Snuff in "Almost Light." I'm not sure what made The Miles Apart decide to get back together and release some new songs, but whatever the reason I hope they stick with it. The songs on this 7" are exactly what I need to hear right now. All three songs are flat out perfect.